At Minimax Exhaust repair Stockport we supply and fit top brands of exhausts for all makes and models of cars while you wait. When we opened in 1970, Mini-Max was one of the first garages in the country to specialise in replacement exhausts. Our team of fitters are highly experienced providing the best solution to each individual exhaust problem. We supply and fit high quality parts as direct replacements at low cost, and are experts in replacing exhaust manifolds and catalytic converters. In addition, we are able to cut and remove flexi pipes and centre or rear boxes out of original one piece factory fit exhausts thus only then fitting one new box rather than two. 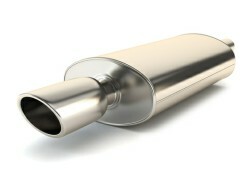 We will offer you a low cost solution to any exhaust problem. At Minimax exhaust repair Stockport, you can be sure of the highest quality workmanship and care for your vehicle and we pride ourselves on customer service that is second to none. We constantly monitor exhaust prices to make sure that our customers benefit from the most competitive rates on the market.